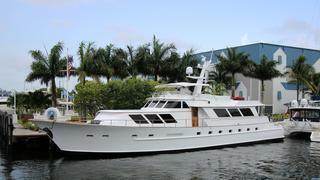 The 30.58 metre motor yacht Mia has been sold with Kit Denison at Denison Superyachts acting for the buyer and seller. Mia was built in aluminium by Broward with delivery in 1981 and had an extensive refit in 2010 which saw much of her interior replaced entirely and a full repaint of hull and superstructure. She features a full width saloon fitted with freestanding furniture, coffee tables and a bar. Forward is the traditional Broward country kitchen complete with marble counter tops and an L-shaped dining area, a favoured spot to enjoy a casual snack. There is also a large, open aft deck with comfortable furniture and shaded by a varnished teak roof leading down to a swim platform, making this area ideal for lounging, dining or water sports. At the center of the forward flybridge console is the upper helm with an array of electronics under a teak and plexiglass cover. There are two teak and white cushioned custom helm chairs, looking forward over the curved, aluminum framed plexiglass windscreen. A large white Bimini top covers the forward half of the flybridge, with built-in aluminum seating for al fresco dining surrounding the large mast island, with storage and a u-line refrigerator/freezer. Accommodation is for six guests in a master suite with a king size bed and two large guest staterooms, all completely refitted in 2010 and all with television screens and en suite bathrooms. Power comes from twin 875hp Detroit Diesel engines. Lying in Dania, Florida, Mia was asking $675,000.